Tales of hardship, love and happiness from the factories of Tate & Lyle, revealing the true story of the female workers who toiled in the firm’s factories in Silvertown during their East End heyday in the 40s and 50s. A Sunday Times Top Ten best-seller and the second-highest history best-seller of the year. They are two of the most familiar sights in kitchen cupboards across the country: Lyle’s Golden Syrup and Tate & Lyle sugar. Yet the ordinary Eastenders who helped build the Tate & Lyle brand and made the two founding families a fortune are largely forgotten by history. Now a new book, The Sugar Girls reveals the true story of the thousands of female workers, many of them as young as 14, who toiled in the firm’s two factories in Silvertown during their East End heyday in the 1940s and 1950s. 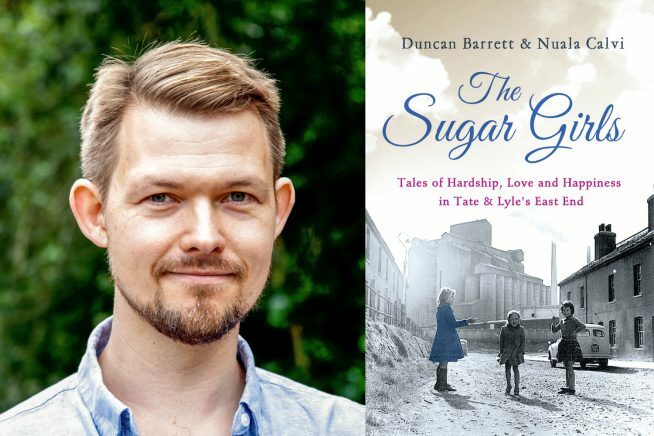 Duncan Barrett is a writer and editor specialising in biography and memoir. He recently edited First World War memoir The Reluctant Tommy. Nuala Calvi is a writer and journalist who has written for The Times, The Independent, The Sunday Express, the BBC, CNN and numerous Time Out books.